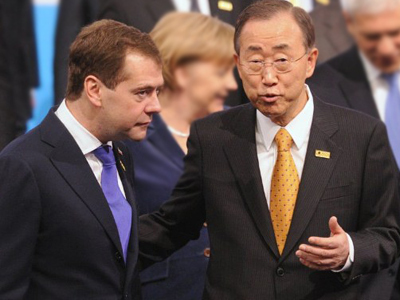 International security in light of the recent events in Libya and Cote d’Ivoire is the focus of the meeting between President Dmitry Medvedev and United Nations Secretary General Ban Ki-moon in Moscow Friday. ­“It makes sense to discuss the current situation in the world and particularly some conflict zones in the Middle East and Africa, the settlement of the North Korean nuclear issue and other topics that are traditionally in the UN spotlight and which are rather important for our country,” Medvedev said, opening the meeting. Russia’s stance is that it is Libya and the Libyan people have to choose their own way, but the international community should assist to the peaceful conflict resolution. Moscow also insists that UN resolutions should be strictly abided by and that the Security Council mandate should not be exceeded. On March 17, the UN Security Council adopted Resolution 1973, imposing a no fly-zone on Libya and opening means for foreign intervention in the civil conflict. 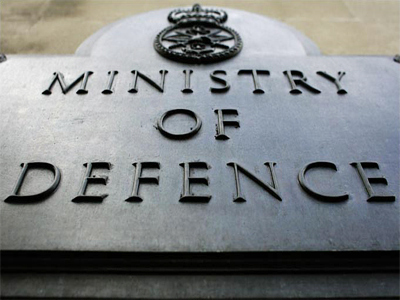 On March 19, Britain, France, the US, Canada and Belgium launched a military operation there. 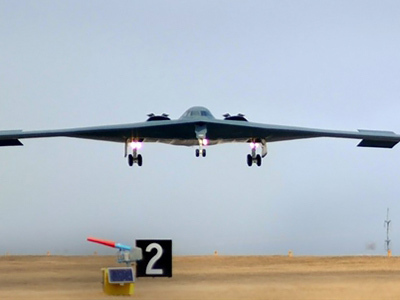 On March 31, the US announced its withdrawal from the mission, handing over the command to NATO. Russia has repeatedly said that it will not join the military mission. “I had meetings with representatives of various organizations in Cairo, including the African Union and the League of Arab States, with the UN representatives, and we agreed to continue close co-operation based on the UN Security Council resolution,” the United Nations secretary-general said in response. On Friday, the Russian president also expressed his condolences to the UN chief over the tragic death of UN staff members – in Afghanistan, when a protest against burning of the Koran turned violent, and in a plane crash in Congo. 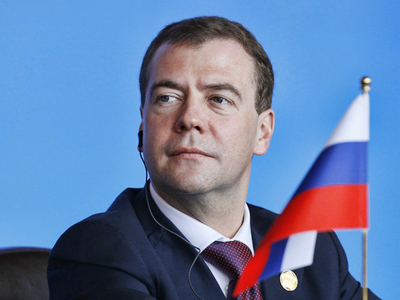 “These sad events show that our world is not safe at all and we have to make much more effort to improve international law and to contribute to the development of democracy and the protection of human rights across the planet,” Dmitry Medvedev noted. In turn, UN Secretary General Ban Ki-moon pointed out the importance of the Moscow-UN partnership and Russia’s significant role within the organization, notably when it comes to new challenges and threats such as climate change and food shortages. A lot of attention at the meting was given to nuclear safety in the light of the accident at the Fukushima-1 power station in Japan, Foreign Minister Sergey Lavrov said during a news conference which followed. 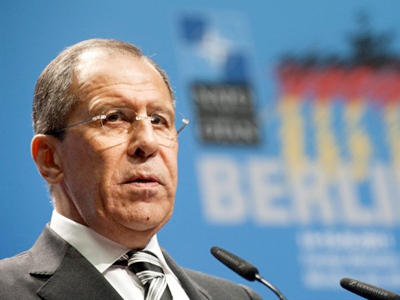 “The president and Mr. Ban Ki-moon were unanimous saying that, apart from overcoming the consequences of the catastrophe, it is necessary to work out new, higher, safety standards with the help of the IAEA, as well as universal rules for reacting to such incidents if they happen somewhere else,” Lavrov commented. 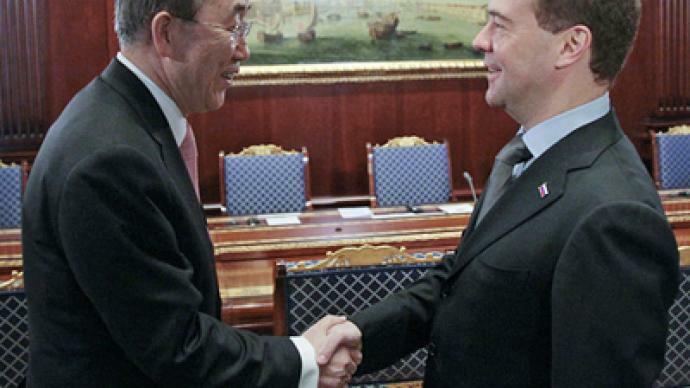 It is the fourth meeting between President Medvedev and the UN chief. The last time they met was on the sidelines of the OSCE (Organization for Security and Co-operation in Europe) summit in Astana on December 1, 2010. The Russian delegation included Foreign Minister Sergey Lavrov, his deputy Gennady Gatilov, Russia’s representative to the UN Vitaly Churkin, presidential aide Sergey Prikhodko, and presidential press secretary Natalia Timakova.